Imagine enjoying season after season with outdoor lighting! Many people assume that outdoor lighting is just a luxury to enjoy during the warmer months, when actually nothing could be farther from the truth. Lighting gives homeowners, and business owners alike, the chance to enjoy the changing seasons in all their majesty. One of the most memorable elements landscape lighting, tree lighting and even architectural lighting provide is a stage for the changing seasons. As your landscape changes, leaves change hues and blooms emerge, outdoor lighting can be there to illuminate each moment as it unfolds. 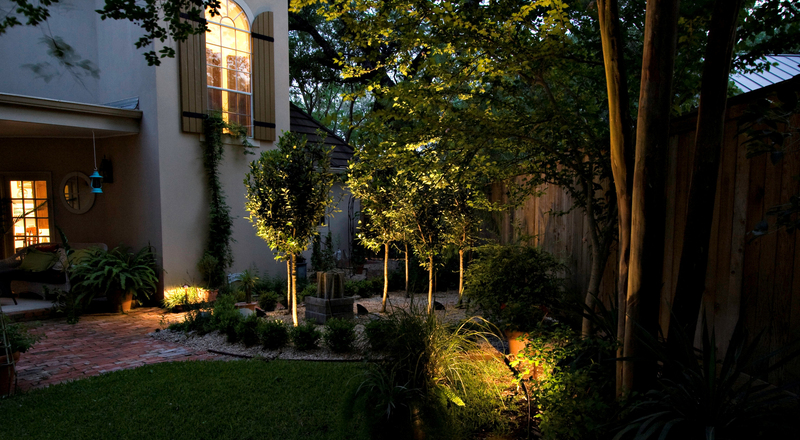 Lighting makes a huge impact as part of your landscape. 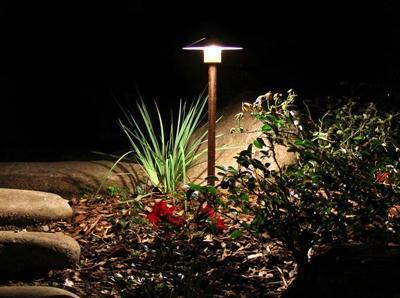 Landscape lighting can be used to emphasize a perennial flower garden that changes with each colored bloom and bud, or a line of flowering trees that transform from hauntingly beautiful barren branches in the winter months to green to mounds of whimsical pink blooms from one season to the next. Even the smallest landscape ornamentals will change personalities from spring to fall. 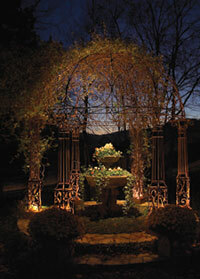 Although your outdoor lighting stays in the same place, the area it illuminates evolves, as does the scenery. Truly professional outdoor lighting will enhance your home, landscape and your lifestyle. 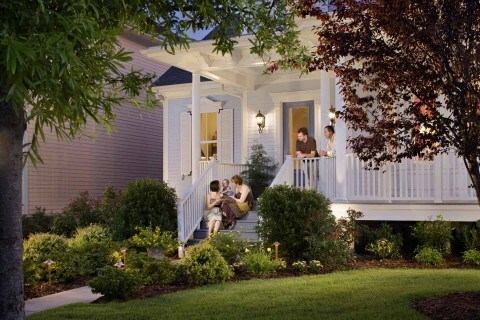 The benefits of outdoor lighting go well beyond beautification and aesthetic enhancement. Lighting also aids in providing a more safe and secure setting for you and your family to enjoy. This includes having a more secure area to enjoy outdoor activities and relax. Security lighting such as path lighting can even makes the trip to your front door more secure because you no longer have to muddle around at a dark entrance to find your keys or while dropping shopping bags! The addition of lighting will make ease, peace of mind and convenience as a way of life. Experts are also quick to point out that outdoor lighting reduces the chances of falling victim to crime because a well lit home, or business, is less likely to become the target of a break-in. A closeup of one of our LED path lights. Although preference of LED over halogen outdoor lighting is really a matter of choice. A higher percentage of our clients opt to go with LED. It is true that LED is more energy-efficient, long-lasting and eco-friendly than traditional outdoor lighting systems; but did you also know LED is more durable? That’s right! LED lighting makes the perfect candidate for outdoor lighting because it holds up better to the harsh elements and the extreme hot and cold of seasonal changes. In additon, since LED is a UV free source of light it is less likely to attract nuisance insects. This means the amount of mosquitoes that are drawn into your deck, patio or oudoor living space by light are reduced making outdoor living more enjoyeable for everyone! 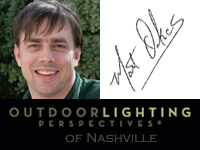 This entry was posted in Garden Lighting, Landscape Lighting, LED outdoor lighting designs, Nashville outdoor living, Outdoor Living in Nashville and tagged architectural lighting, Garden lighting, How landscape lighting enhances every season in your Nashville landscape, Landscape Lighting, Nashville landscape and garden lighting, Nashville landscape lighting, Nashville LED outdoor lighting, outdoor lighting Nashville, Outdoor Lighting Perspectives of Nashville by outdoorlightingnashville. Bookmark the permalink.